Carlyle Group-backed Ampere Computing, run by ex-Intel president Renée James, has launched a server-grade Arm system-on-a-chip to take on Chipzilla. 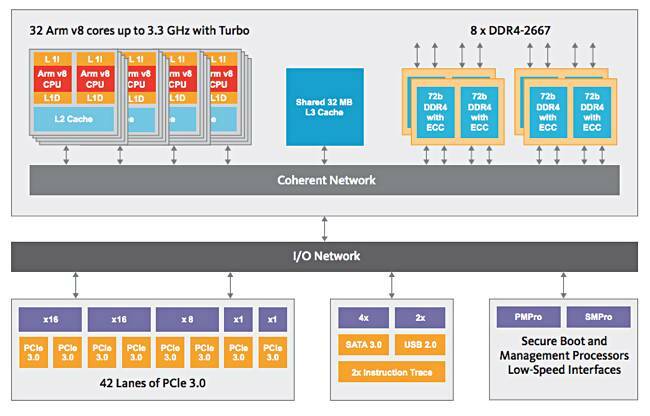 The SoC has a 32 64-bit Armv8 CPU cores, operating at up to 3.3GHz with turbo mode support. There are private 32KB of code and 32KB of data L1 caches per core, 256KB L2 caches for each pair of cores, and a 32MB L3 cache for all the cores. The technology is based on TSMC's 16nm FinFET+ process and has a power envelope of 125W. Ampere claimed the chip offers more retrieve-and-compute capability within your current data centre footprint while significantly lowering power and operating costs. There is an Ampere platform delivered in a 19-inch chassis with an evaluation board possessing a built-in power supply, DRAM memory, storage disks and networking. It comes with various firmware features, the CentOS operating system, and tools. James, chairman and CEO of Ampere Computing, left Intel in 2016 and became an operating executive for private equity investor Carlyle. Ampere is owned and funded by the Carlyle Group, which bought the X-Gene Arm server assets from MACOM in October. These assets were shopped around as MACOM only acquired them as part of its Applied Micro Circuits purchase in November 2016. The X-Gene 3 design featured 32 x Armv8-A 64-bit cores, support for 1TB of DRAM and 42 x PCIe 3.0 lanes. It looks like the Ampere SoC is based on the Applied Micro Circuits X-Gene 3 design, and various analysts have been weighing in about this. We might expect the product to ship around the middle of the year. Get an Ampere product brief here [PDF], and register for a full data sheet here.